Krispy Kreme’s new limited edition Green Hornet Doughnuts would be the last thing you’d expect to start a wave of nostalgia. One, the original Green Hornet wasn’t a part of my childhood. And two, neither are Krispy Kremes, especially not bubblegum flavored ones with *gasp* a cool mint drizzle. But one bite, despite my many misgivings, quickly took me back to days when I’d dash to the sari-sari store two houses down the street as soon as I got back from school. “Tarzan!” “Judge!” “Doublemint!” “Big boy!” “PEPSODENT TOOTHPASTE! Parang bebelgum!” An argument quickly ensued in the office about what childhood bubblegum it reminded us of. Even zombies agree! Almost better than brains! While we couldn’t agree on the bubblegum brand (and in one person’s case toothpaste brand), we agreed that it was yummy. The sweetness was just right and the minty follow-up was refreshing. It’s definitely worth trying, even if it’s just to spend a few moments immersed in the past. 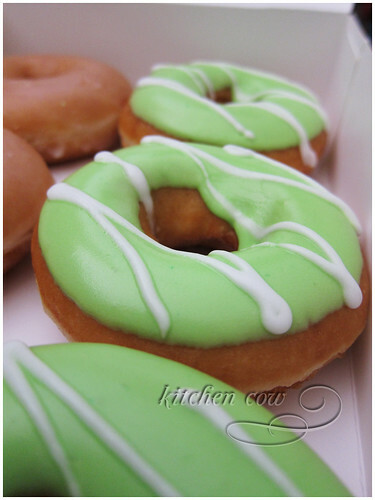 The Green Hornet Krispy Kreme doughnut–officially called Green Iced Sting–is a movie tie-in with the new Green Hornet movie (the one with Seth Rogen and Jay Chou) so be sure to grab it before the curtains go down on it on February 13. 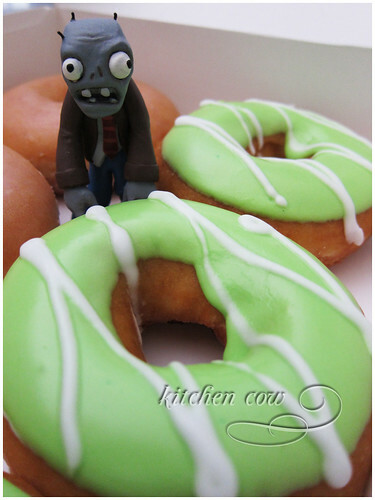 This entry was posted in food spotlight, restos & eateries and tagged donut, doughnut, green hornet, jay chou, krispy kreme, krispy kremes, limited edition doughnuts, movie, seth rogen, tie-in. Bookmark the permalink. Yummy! I haven’t had Krispy Kremes since I was hospitalized for abusing my kidneys and digestive system with too much sweets. LOL! But I must visit KK one of these days. I missed them. HUY! Don’t play around with your health. Moderation in all things, remember, your hospital experience was way painful. Hehe, not a pandan-fan huh?